With temperatures peaking the 90 degree mark, the first semifinal of the 2014 BB&T Atlanta Open was on the minds and lips of just about everyone at Atlantic Station on Saturday. From serious to casual tennis fans, they all wanted to see how young Jack Sock would fare against the defending champion and top seed, John Isner, on U.S. Open-like hard courts. Isner may hold a 3-1 career mark over Sock, but Sock won their previous meeting two weeks ago on grass in Newport, R.I. at the Hall of Fame Championships. When asked about his next opponent following his win over Marinko Matesevic on Friday, Isner didn't seem too worried – for good reason. With players not getting much more than a sniff on the returns of serve through the first 11 games of the match, it was Isner who saw three break points in the twelfth game. All of these were set points for Isner and he was finally able to convert on one when Sock sprayed a backhand wide, awarding the former Georgia Bulldog, 7-5. 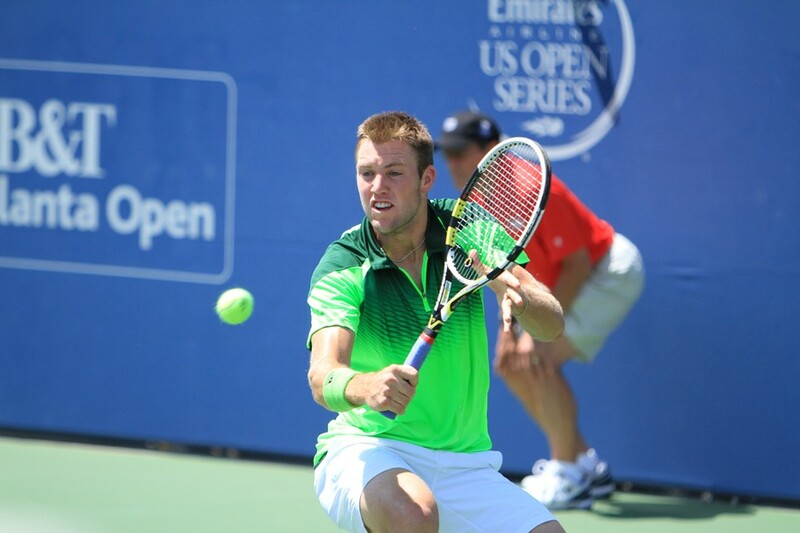 Jack Sock reaches second straight semifinals round, but fails to top defending champ John Isner Saturday. Isner, traditionally a good front runner, seemed to push the issue with Sock early in the second set. He earned some early break point chances, but didn't convert. That would set him up for chances he would have later in the set. With no breaks through the first nine games of the second set, it was Isner who dictated play in the tenth game. As a result, this put pressure on Sock, and he double faulted to hand Isner the match (7-5, 6-4) and his fourth Atlanta Open final appearance. "I felt better out there today. I felt it maybe wasn't as humid. The humidity gets to me more than the heat,” said Isner. The tough conditions made Isner play more aggressively. "I told myself, I could put a little pressure on him," smiled Isner. "I thought I played pretty well. Jack is real good player and he is so young." The 6'10" Isner returns to a final in what is quite possibly his favorite place to play. "This feels like my hometown. I feel like it's my time of the year,” added Isner. *In the first doubles semifinal, the team of Steve Johnson and Sam Querrey edged Kevin King and Michael Venus in a match tiebreak, 6-7 (6), 7-5, 10-7.